The arena opened on June 19, 1993, with a Barry Manilow concert as its first event. Since then, it has been host to a number of events, such as the 2003 and 2007 Stanley Cup Finals. On June 6, 2007, the Anaheim Ducks defeated the Ottawa Senators, 6–2, in game five of the Final at Honda Center to clinch the franchise's first Stanley Cup championship. Honda Center has hosted several UFC events, starting with UFC 59 in 2006. It hosted the 2005 IBF World Championships for badminton in 2005. From 1994 to 1998, it served as a second home for the NBA's Los Angeles Clippers. It was the home arena for the Anaheim Bullfrogs of Roller Hockey International from 1994 to 1999 and for the Anaheim Piranhas of the Arena Football League from 1996 to 1997. This arena has also hosted a PBR Bud Light Cup (later Built Ford Tough Series) event annually since 1998. Since 1994, the arena has hosted the annual Wooden Legacy basketball tournament. In 2011, the arena began hosting the Big West Conference Men's and Women's Basketball tournaments. The arena has also hosted the NCAA Men's Basketball Tournament seven times, as the West Regional site – 1998, 2001, 2003, 2008, 2011, 2014, 2016 and 2019. 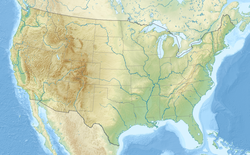 It even hosted the Frozen Four, the semifinals and final of the NCAA Men's Ice Hockey Championship, in 1999, underscoring the popularity of hockey in the region. On December 6, 2000, music legend Tina Turner played her last concert at the arena for the record breaking Twenty Four Seven Tour, but after popular demand, Turner returned to the arena before a sellout crowd on October 14, 2008, for her Tina! : 50th Anniversary Tour. 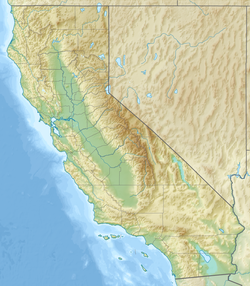 The Honda Center lies northeast across California State Route 57 from Angel Stadium (where Major League Baseball's Los Angeles Angels of Anaheim play) and roughly 3 miles (4.8 km) from Disneyland Park. It is also across the street from Anaheim Regional Transportation Intermodal Center with service by Amtrak (Pacific Surfliner), Metrolink (Orange County Line), Anaheim Resort Transit, Orange County Transportation Authority and private transportation companies. The arena seats up 17,174 for its primary tenant, the Ducks. It takes only five hours to convert Honda Center from a sporting arena to an 8,400-seat amphitheater. There are 84 luxury suites in the building, which has hosted 17.5 million people, as of 2003. In 2005, the arena became the first in the U.S. to have two full levels of 360° ribbon displays installed. Daktronics of Brookings, South Dakota, designed, manufactured and installed the 1,800 feet (550 m) of full-color LED technology. Outside the venue, the marquee was upgraded with two large video displays measuring 8 feet (2.4 m) high by 21 feet (6.4 m), and a new marquee was built with more LED video displays. Broadcom chairman Henry Samueli owns the company that operates the arena, Anaheim Arena Management, LLC, and the arena's primary tenant, the Ducks, giving him great flexibility in scheduling events and recruiting new tenants. Samueli hopes to bring an NBA team to the arena. In 2015, Samueli purchased the Norfolk Admirals of the American Hockey League and, with the AHL incarnation of the Admirals relocating to San Diego to become the reactivated San Diego Gulls, it is anticipated that Samueli through Anaheim Arena Management will purchase Valley View Casino Center in that city in time for the 2015–16 AHL season. During the 2014–2015 NHL Season, it was announced that Honda Center would get a new scoreboard that will replace the one that was in place since its opening in 1993. The new scoreboard made its debut in a Ducks Preseason game against the Los Angeles Kings. Affliction: Banned was held in the Honda Center. UFC 59, UFC 63, UFC 76, UFC 121, UFC on Fox 1, UFC 157 and UFC 214 were held in the Honda Center. The arena has hosted a number of WWE events including WrestleMania XII, Royal Rumble 1999, WrestleMania 2000, as well as various episodes of Monday Night Raw and SmackDown. Barbra Streisand recorded the final date here from her first tour in 30 years Barbra Streisand in Concert in June 1994. Smashing Pumpkins performed on December 9th and December 10th in 1996 as part of their Mellon Collie and the Infinite Sadness tour. Janet Jackson performed for the first time at the arena during her The Velvet Rope Tour on August 23, 1998. She returned for her All for You Tour on September 29, 2001. On September 23, 2017, she performed again as part of her State of the World Tour. TLC performed at the arena on January 10, 2000 during their FanMail Tour. The tour would be their last as a trio. Band member Lisa "Left Eye" Lopes was killed in a car accident in April 2002. Britney Spears performed on 20 November 2001 during her Dream Within a Dream Tour. She returned in April 19 and 20, 2009 for her The Circus Starring Britney Spears and on June 24, 2011 with her Femme Fatale Tour. Mariah Carey's latest DVD release, entitled The Adventures of Mimi was recorded at the Honda Center on October 8, 2006, during The Adventures of Mimi Tour. The Jonas Brothers recorded the companion album to their 3-D concert movie at the Honda Center. U2 performed at the arena five times: the first, the second and the third were on April 23, 24 and 26, 2001 during their Elevation Tour, in front of a total sold out crowd of 49,377 people. The fourth and the fifth were on April 1 and 2, 2005 during their Vertigo Tour, in front of a total sold out crowd of 33,535 people. Depeche Mode performed at the arena seven times. The first and the second were on December 20 and 22, 1998 during their Singles Tour. The third and the fourth were on August 18 and 19, 2001 during their Exciter Tour. The fifth one was on November 23, 2005 during their Touring the Angel. The sixth one was on August 19, 2009 during their Tour of the Universe, in front of a crowd of 12,430 people. The 2009 show was recorded for the group's live albums project Recording the Universe. The seventh was on May 22, 2018 during their Global Spirit Tour. K-pop artists under S.M. Entertainment featuring BoA, TVXQ, Super Junior, Girls' Generation, SHINee, f(x) and EXO, performed the first show of their third world tour SMTown Live '12 World Tour making them the first Korean artists to perform at the arena. The May 20, 2012 show was an instant sell out. South Korean TV broadcast network MBC filmed and later aired an edited version of the concert. Jennifer Lopez brought her Dance Again World Tour to the arena on August 11, 2012. K-pop boy band BIGBANG performed their first concert in the U.S. at the arena on November 2 and 3, 2012 as part of their Alive Galaxy Tour. They returned to the arena on October 4, 2015 for their Made World Tour. Katy Perry brought The Prismatic World Tour to the arena on September 16 and 17, 2014. Miley Cyrus performed in the Center during her Bangerz World Tour on February 20, 2014 making it Cyrus' 3rd sold-out concert at the Honda Center after previously selling out the Center during her Best of Both Worlds Tour on November 3, 2007 and again during her Wonder World Tour on September 23, 2009. Ariana Grande brought The Honeymoon Tour to the arena on April 10, 2015. She returned to the arena on March 30, 2017 for the Dangerous Woman Tour. Chris Brown performed for a sold-out crowd during his One Hell Of a Night Tour on September 18, 2015. Selena Gomez brought her Revival Tour to the arena on July 9, 2016. Demi Lovato & Nick Jonas brought their Future Now Tour to the arena on August 17, 2016. Pentatonix brought their Pentatonix World Tour 2016 to the arena on October 20, 2016. Twenty One Pilots brought their Emotional Roadshow World Tour to the arena on February 15, 2017. BTS brought their 2017 BTS Live Trilogy Episode III: The Wings Tour to the arena on April 1 and 2, 2017. Live Nation hosted their 2017 Southern California Country Megaticket at the center due to the lease being up at Irvine Meadows Amphitheater which has been demolished to make way for housing. Kendrick Lamar brought The Damn. Tour to the arena on August 11, 2017. Jay-Z brought his 4:44 Tour to the arena on October 27, 2017. Mayday brought their Life Tour to the arena on November 11, 2017. Imagine Dragons brought their Evolve Tour to the arena on November 16, 2017. Shakira brought her El Dorado World Tour to the arena on August 31, 2018. Fall Out Boy brought their Mania Tour to the arena on September 29, 2018. 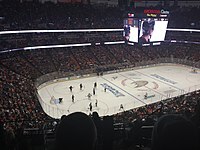 A fictional version of the arena, known as "The Pond", is featured in the Mighty Ducks animated series. "2162 Votes", the West Wing season 6 finale, features the arena for interior shots of the Democratic National Convention. ^ "Honda Center". Hockey.ballparks.com. Retrieved 2013-02-22. ^ Shaikin, Bill; Johnson, Greg (July 20, 2006). "Pond to Get a New Name". Los Angeles Times. ^ a b "About Us | Honda Center". www.hondacenter.com. Retrieved 2019-03-13. ^ "2007 NHL Stanley Cup Stanley Cup Final: ANA vs. OTT". Hockey-Reference.com. Retrieved 2019-03-13. ^ "UFC 59 | UFC". www.ufc.com. Retrieved 2019-03-13. ^ "2005 IBF World Championships – Men's Doubles". memim.com. Retrieved 2019-03-13. ^ "Professional Bull Riders". www.pbr.com. Retrieved 2019-03-13. ^ "Wooden Classic, Anaheim Classic merge". Orange County Register. 2013-06-04. Retrieved 2019-03-13. ^ "Big West Tournament 2019 | Honda Center". www.hondacenter.com. Retrieved 2019-03-13. ^ "Daktronics Photo Gallery: Honda Center". ^ Haggerty, Kevin (2012-11-14). "UFC 157 set for Honda Center in Anaheim". MMAmania.com. Retrieved 2012-11-14. ^ Danny Segura (2017-02-24). "UFC 214 in Anaheim changed to July 29". mmafighting.com. Retrieved 2017-04-21. ^ Powell, John (April 2, 2000). "WrestleMania 2000 a flop". Slam! Sports. Canadian Online Explorer. Retrieved March 16, 2008. ^ Casacchia, Chris (April 4, 2011). "Royal Reach: NBA Team Would Boost Honda Center Business, Bring Challenges". Orange County Business Journal. 34 (14): 66. 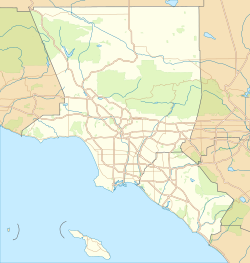 Wikimedia Commons has media related to Honda Center.